I’d rather have a hundred thousand or a million people saying I’m nuts and I’m crazy for my musical choices and what I’ve said lyrically, than a million people all raising their hand on the first day. A lot of times black folks look for love in all the wrong places. You’re always looking for somebody to love you, be accepted, and there’s the insecurities that are even transmitted through rap. Everyone is trying to aim to please too much. Of course voting is useful. But then again, I don’t put a big glow to it. Voting is about as essential as washing yourself. It’s something you’re supposed to do. Now, you can’t go around bragging, expecting to get props because you voted. That’s stupid. We don’t see the people who are doing real things getting enough props. We often see politicians who are everywhere but nowhere at the same goddamn time. You know the kind of person: You see them everywhere on television but nowhere in front of your face. You have to wait for people to program you. The only difference is the amount of people that you’re going to reach but that’s going to even out in the next two or three years anyway. Computers are being bought faster than televisions right now. 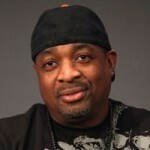 Carlton Douglas Ridenhour, better known by his stage name Chuck D was born in Roosevelt, New York. He is an American rapper, author, activist, teacher, publisher and producer. He received a B.F.A. from Adelphi in 1984 and later received an honorary doctorate from Adelphi in 2013. In 1990, he appeared on "Kool Thing", a song by the alternative rock band Sonic Youth, and along with Flavor Flav, he sang on George Clinton's song "Tweakin'", which appears on his 1989 album The Cinderella Theory. In 2009, Ridenhour wrote the foreword to the book The Love Ethic: The Reason Why You Can't Find and Keep Beautiful Black Love by Kamau and Akilah Butler. Chuck D duetted with Rock singer Meat Loaf on his 2011 album Hell in a Handbasket on the song "Mad Mad World/The Good God Is a Woman and She Don't Like Ugly".